Maxim II - Morris Industries Ltd.Morris Industries Ltd. 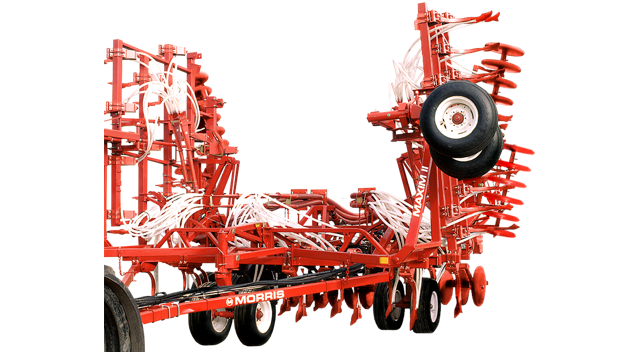 The Morris Maxim II Air Drill raises the bar on hoe drill seeding accuracy and dependability. A patented frame coupling system assures the ultimate in frame flexibility and land following. Heavy packer tubing, improved wing lift geometry, and added hitch trussing on the larger units provide greater strength and reliability. A flexible frame design offers unmatched land following ability and stability. A patented frame coupling system assures flexibility, with individual frames attached to the tow bar by a single universal ball joint. Rear stabilizers ensure proper tracking in working position for fully flexible front-to-back and side-to-side land following. Three-frame models are available in 34 and 39 feet widths. Five-frame models are available in 49 and 60 feet widths. Frame clearance and dependable depth control allows for seed placement through crop residue. A unique trip pattern on a four-row configuration provides optimum trash flow. Optional edge-on shanks tackle heavy surface residue with minimum soil disturbance. Row spacing options are 7½ inch, 10 inch and 12 inch. A simple, adjustable collar depth stop ensures the hydraulic depth cylinders won’t creep. Once set, consistent depth is locked in across the width of the machine. Durable front castor wheels and rear packer wheels control depth. Built to take punishment from the toughest field conditions. The Maxim II features a 400-lb C-Shank or Edge On spring cushion trip. The trip reduces pressure by lifting high to minimize stress on the shanks, trip components and frame. Choose 1 inch Edge On or 1 inch or 1¼ inch C Shanks to match your soil conditions. In-frame transport wheels retract above the frame in working position. The Maxim II features excellent clearance for traveling on crowned roads. Transport hydraulic controls and automatic locking mechanisms allow the unit to fold easily and safely for transport. Rubber or steel packer wheels in 3½ inch or 4½ inch widths. Optional rock deflector, mud scrapers and two-bar straight tine leveling harrows are also available. © 2019 Morris Industries Ltd. All Rights Reserved.